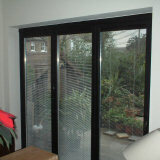 We offer integrated blinds for our bifolding doors. 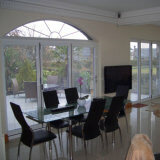 Venetian style blinds that are actually installed INSIDE the double glazed sealed unit - between the two sheets of glass. These impressive looking blinds never require cleaning, allow you your privacy and shield furnishings eyes and delicate skin from the suns rays. Perfect for reducing the glare on the TV in a conservatory. The advantage of having your blinds incorporated into your sealed units is that they don't require the constant dusting and maintenance associated with conventional blinds. Integral blinds allows a room to have both privacy and protection from bright sun light, without obscuring your view, while still allowing light into a living or working space. The aluminium blades can be raised, lowered and tilted to effectively diffuse the light and obscure the vision of prying eyes. If you don't want opaque glass that will constantly impair your view, then these blinds are for you! 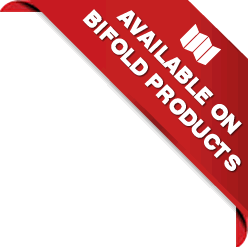 Push Block operated integrated blinds are a simple and reliable manual system. They function with surprising speed and grace. Raise, lower and tilt functionality is achieved by simply sliding the push blocks along side border rails. Utilises double side boarder rails. Raise, lower and tilt functions. Electronic Control Unit operated integrated blinds is a patented high performance low voltage electronic system, that utilises a wireless magnetic transmission plate. Simply use the battery powered control unit to raise, lower and tilt the blinds. ¹Please Note: Electronic Control Unit is not a remote control, and must be in contact with the transition plate in order to operate the blinds. To make these blinds remote control you require a bluetooth electronic control unit per unit and a seperate remote control, this is an extra over.